Testing of drone delivery services by Amazon is a future step towards quick product delivery. Amazon is a well-established multi-billion dollar eCommerce company that is catering to a large volume of customers globally. It has made a name for itself due to its huge product catalog, effective fulfillment services, online marketplace facility and product delivery services. The company has been continuously working to improve the user experience and online shopping experience for its targeted customers to optimize its product sales and conversion rates. With improvements in its eCommerce services through initiatives like Amazon Prime Now (Instant one hour product delivery services) , Amazon Dash (consumer goods ordering service), Amazon Video Direct (online video rental/purchase store), Amazon Music Unlimited (Music streaming service), AmazonFresh (online grocery store) and other such efforts. Since, its beginning on 5th July, 1994, the eCommerce giant has traversed a long distance for changing the way people shop online. The company received the official nod for its future drone delivery project named as Amazon Prime Air by the Britain’s Civil Aviation Authority to conduct drone testing in July, 2016. The permission included operating drones for beyond line-of-sight operations in rural and sub urban areas, utilization of sense-and-avoid sensor based technology and the clearance for operation flights in cases where one person handles multiple highly-automated drones. Keeping up the same momentum of better customer engagement and online shopping experience, Amazon has finally rolled its ambitious Amazon Prime Air service to deliver its products within 30 minutes of ordering. This wonderful drone delivery program of Amazon has finally seen the day of light when it performed the first customer delivery in the Cambridgeshire, England on 7th December, 2016. The delivery package consisted of an Amazon Fire TV and a bag of popcorn to be delivered towards a two-storey farmhouse in rural areas of Cambridge, U.K. within 13 minutes of the customer making an order. The first of its kind product delivery effort was a great step in the Amazon Integration and sales improvement efforts for optimizing online shopping experience. This pilot product delivery project of Amazon was started from the Cambridgeshire drone testing facility located outside the university town of Cambridge in the short range of five miles. The project took off with the permission of Britain’s Civil Aviation Authority to deliver customer orders to rural areas within 30 minutes or less time. Currently, the trial is available for only two customers residing nearby the Amazon’s testing facility but the number is expected to rise by upto dozen people living within few miles in the coming months. Jezz Bezos, the founder and CEO of Amazon informed about this milestone achievement through his Twitter tweet to millions and billions of customers around the world. Here is a Twitter handle image that shows his statement about this Amazon Prime Air service. 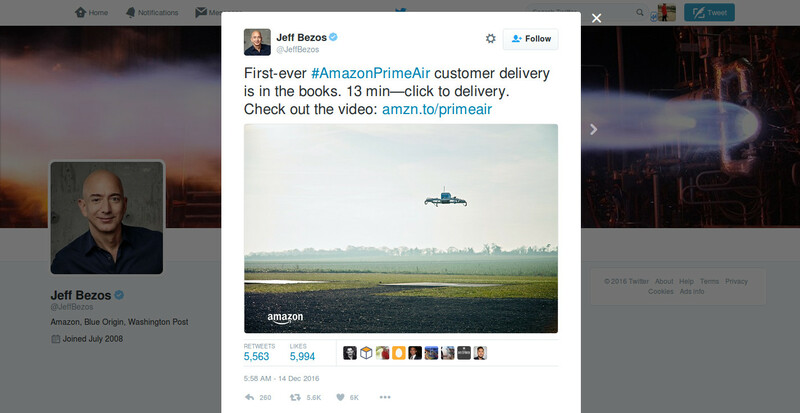 Jeff Bezos expressed his views on Twitter during the launch of Amazon Prime Air services. It is certainly a breakthrough move that can define the aerial product delivery as an affordable and practical business attempt much before the expected time period. This drone delivery is applicable for all those customers that have spacious gardens and lives nearby the delivery depot. This trial service currently supports the items that are less than 5 pounds or 2.6 kg in weight. Why is Drone delivery services the future of shipping services? Amazon is looking to explore drones for delivering products to rural, urban and semi-urban areas. In its pursuit of providing a highly optimized online shipping services, Amazon has performed the trial of its drone delivery services known as Amazon Prime Air for its rural customers. These delivery drones are a part of long-term eCommerce shipping integration services of Amazon that are aimed at developing its own transportation network for effective control on its product deliveries. The effort is in direct competition with the one day delivery facility offered by UPS and FedEx Corp.
Apart from the competition with the rival shipping companies, there are other important factors that are responsible for this changed scenario. Skyrocketing shipping services, the requirement of greater control on supply chain services, increasing demand for speedy product deliveries and other such reasons paved the way for the rise of drone-based product delivery. As per the estimate of this Seattle based company, the shipping costs were escalated around 43% which accounted for an amount of $3.9 billion. The drone delivery has been thought as the future delivery option as the product delivery in rural areas is the biggest challenge and proves to be more costly and inaccessible due to the bad roads coupled with inefficient transportation services. For getting a better idea about this new drone delivery services of Amazon, check out the video for the complete journey from the Amazon’s drone testing facility till the customer premises for product delivery. E-Commerce services are full of challenges due to the problem in quick product delivery services as not all shipping services can deliver products within the scheduled time period only. To tackle such a situation, you need to either take the help of an effective eCommerce shipping integration services or automate the existing supply chain services through processes like eCommerce PickPack services. Being an eCommerce site owner, you need to be prepared in a better way to respond to the continuous efforts of Amazon sales and Improvement services in the form of Amazon Prime Air services and other such efforts. If you are not able to find a suitable alternative, it would be better for you to integrate your online store with this mega billion eCommerce giant or you can take the help of a reputed eCommerce services company to make your individual presence felt.